This remarkable figure founded Markham and also played a key role in the development of York (now Toronto). In 1794, Berczy brought 186 German settlers to Upper Canada, where they built a section of Yonge Street, a military and commercial artery. 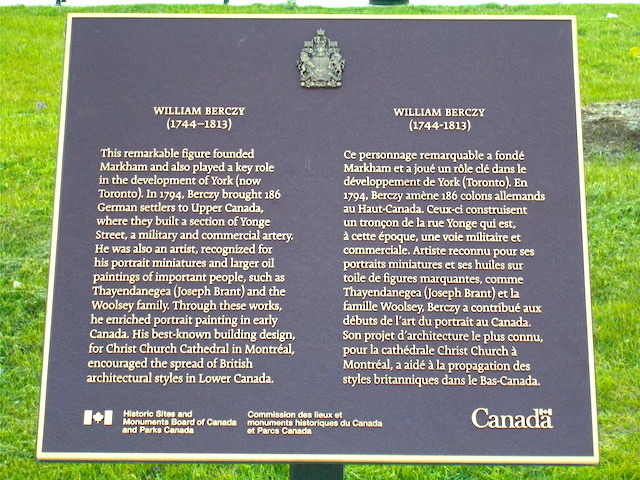 He was also an artist, recognized for his portrait miniatures and larger oil paintings of important people, such as Thayendanegea (Joseph Brant) and the Woolsey family. Through these works, he enriched portrait painting in early Canada. His best-known building design, for Christ Church Cathedral in Montréal, encouraged the spread of British architectural styles in Lower Canada.